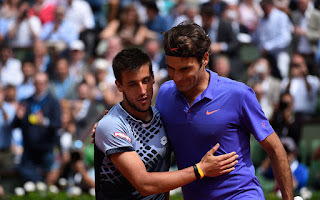 For Bosnia's Damir Dzumhur it was the day he had dreamed of while for Roger Federer it was just another day at the office. 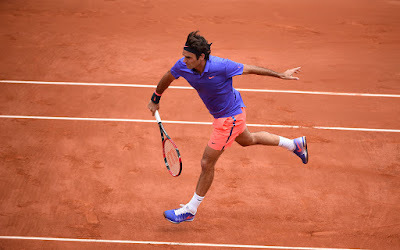 The two, from vastly different tennis backgrounds, met across the net for the first time on Friday when Federer's class told in a 6-4 6-3 6-2 win to continue his smooth progress at the French Open. Federer, 33, is yet to drop a set in three rounds as he tries to win the title for a second time after his 2009 triumph. Dzumhur, born in Sarajevo in 1992, the year the city was besieged in a bitter civil war that killed thousands, played his part in an entertaining contest. The world number 88, the first Bosnian man to contest a grand slam at the 2014 Australian Open, impressed the 17-times grand slam champion with his drop shots and was not overawed on Court Phillipe Chatrier, the biggest stage he has played on. "When I was warming up, I was still not believing that I was playing Roger Federer," he told reporters. "Really, it felt so strange for me, like I'm dreaming... But then, suddenly, I switched when I started to play." Federer broke serve in the fifth game, which was sufficient to bag the first set, and a majestic backhand pass gave him a break at the start of the second. The agile Dzumhur stuck to his task, earned some chances himself and even broke Federer when the Swiss served for the second set at 5-2, flashing a stunning backhand down the line. The end came quickly in the third set but Dzumhur walked off with his head held high and 85,000 euros richer, a lot of money for a player who has virtually no financial support from his hard-up home federation. 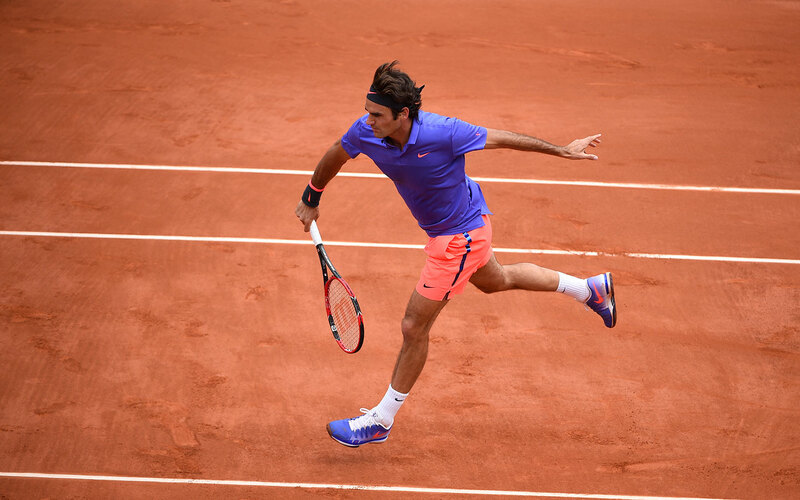 Federer had some kind words for his opponent after notching his 64th career victory at Roland Garros and recalled when he walked out on court to play against his idols. "It was the most exciting time almost in my playing career, going from that phase from juniors to pros, and then rubbing shoulders with those guys," said the former champion. "Seeing them prepare, joke around, being one of you, basically, and all of a sudden you become friends with them. I think it's very cool. "I thought Damir played well. I think he played drop shots well. He moves well. So I thought it was an entertaining match. I wish him all the best for the year and for the future." Dzumhur was contesting the third round of a Grand Slam for the second time, having also reached the last 32 at the 2014 Australian Open as a qualifier. He is the only man from Bosnia/Herzegovina ever to play at a Grand Slam championship. 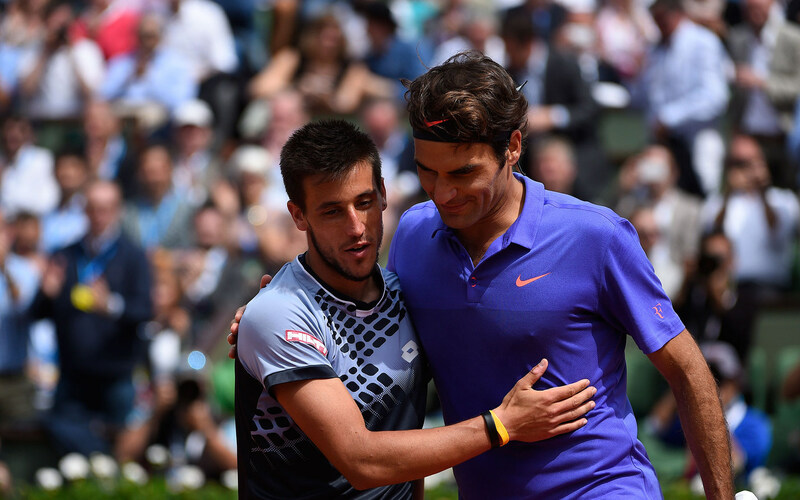 "I guess it was entertaining," said Dzumhur. "I really was excited before the match. I didn't feel that much pressure like I felt with Berdych last year, or with Ferrer. So I came a bit more relaxed on the court and started good. That was okay. So I feel that everything was okay. My game was good. I just can say that Roger played really too good today. He was playing so aggressive with all kind of shots. Big congratulations to him. Of course I was always saying that he's the best tennis player for me, and today he show why." Federer will face either French showman Gael Monfils or Uruguay's Pablo Cuevas for a quarter-final place.